The U.S. government is abandoning a legal battle to require that cigarette packs carry a set of large warning labels depicting the dangers of smoking and encouraging smokers to quit, according to a letter from Attorney General Eric Holder obtained by Associated Press. The government had until Monday to ask the U.S. Supreme Court to review an appeals court decision upholding a ruling that the requirement violated First Amendment free speech protections. 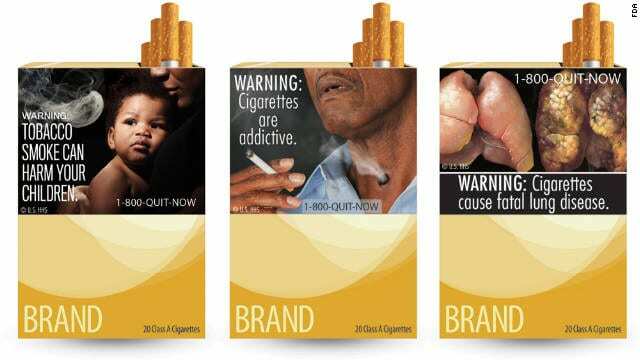 Some of the nation’s largest tobacco companies sued to block the mandate to include warnings on cigarette packs as part of the 2009 Family Smoking Prevention and Tobacco Control Act. This entry was posted on March 20th 2013 at 4:34pm/16:34 and is filed under Live News Column 1. You can follow any responses to this entry through the RSS 2.0 feed.